The water company were, in 2015, clearing out the ditch that runs down Newgate past the allotments to the Waterworks and beyond. (See map above - Enclosure Map 1806.) This got a few of the older residents in the village talking and I was intrigued to learn that the grandfather of an older resident of Kirby Cane had told him that: "When the grandfather was a boy he remembered catching baby flatfish in the dyke that runs down Newgate." Having researched the River Waveney somewhat, I know that there is evidence for the tidal flow to run, in Roman times, all the way inland towards Scole near Diss where there are quaysides that have been excavated. There is also good present day evidence for the tidal flow at Ellingham Mill where the rise and fall is quite considerable. Further evidence for the tidal flow going well inland can be seen all around the country, a good example being the tidal bore on the River Severn. How does this relate to the Main Run Drain at Newgate? 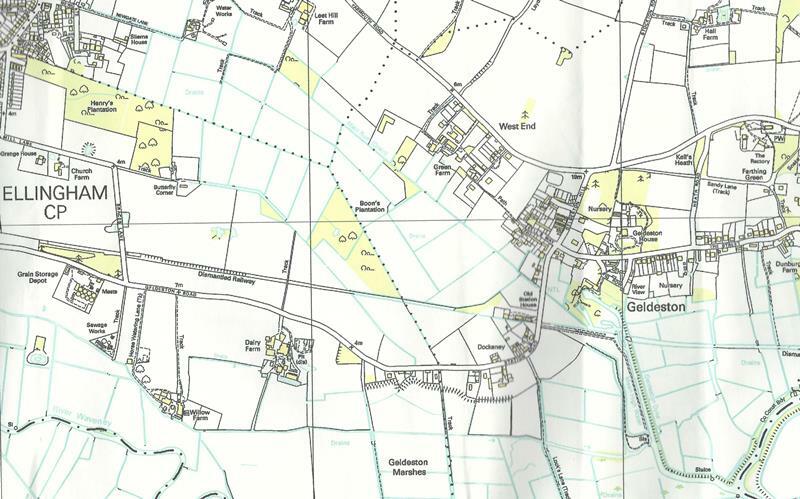 Well, if you look at the map you will see that the drain flows from Ellingham Island and Kirby Row to Geldeston Dyke. If you go down to Geldeston there is a sluice gate that stops the tidal flow from coming up the Main Run Drain these days. This can be seen on the map below. Further memories were that there was once a bridge for the Main Drain near to the shop. I have checked this on the Enclosure Map and sure enough there it is; the 14th Bridge is marked on the map, as can be seen above. Various navigation acts during the 18th and 19th centuries allowed locks and sluices to be built along the R. Waveney cutting off the effect of the tides. Prior to this there was nothing to stop the tidal flow reaching up into the Main Run Drain and up to Newgate itself. I would also see a connection here with the Origins of Kirby Cane: the dyke was almost certainly navigable in Roman times and up to the building of the Locks at Geldeston. Hence the possibility for the Vikings to move up river to settle here.